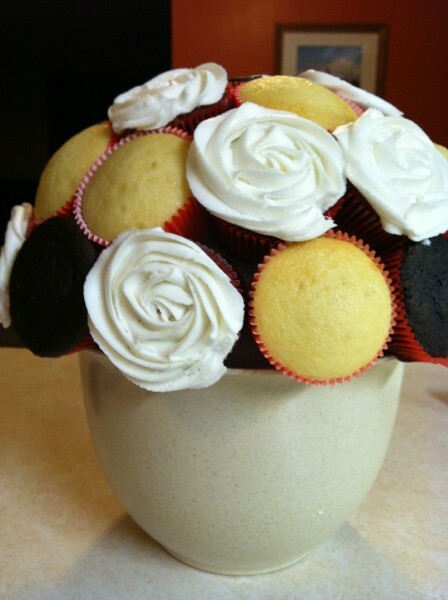 I recently made a cupcake bouquet with my extra cupcakes for a dessert auction. I had been wanting to try it for quite a while but had no reason to. What I found was that it was easier than I had thought. 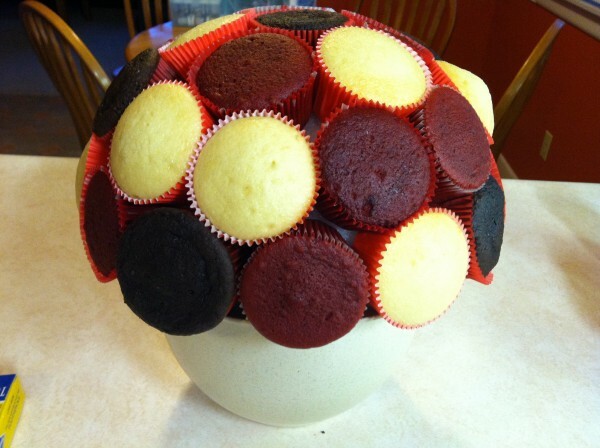 This makes a great centerpiece for any occasion and the cupcakes easily slide off when it’s time for dessert. Place the styrofoam ball in the pot and push it down so it’s secure. Then slide 2 toothpicks next to each other into the ball near the top of the pot. I used 2 toothpicks so that the cupcakes didn’t turn. Make sure the toothpicks are pushed in far enough because next you’re going to slide a cupcake right down on top of the toothpicks so that the toothpicks puncture the bottom of the cupcake. Continue placing toothpicks in the ball and cupcakes on the toothpicks until you make it all the way around the ball. Try to get the cupcakes as close as you can. 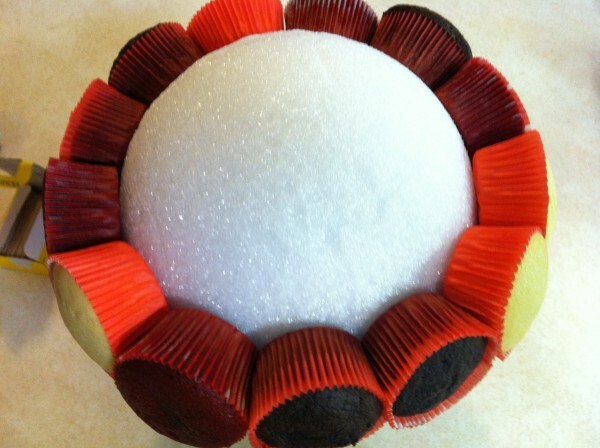 Continue to place toothpicks into the ball and slide cupcakes onto the toothpicks. 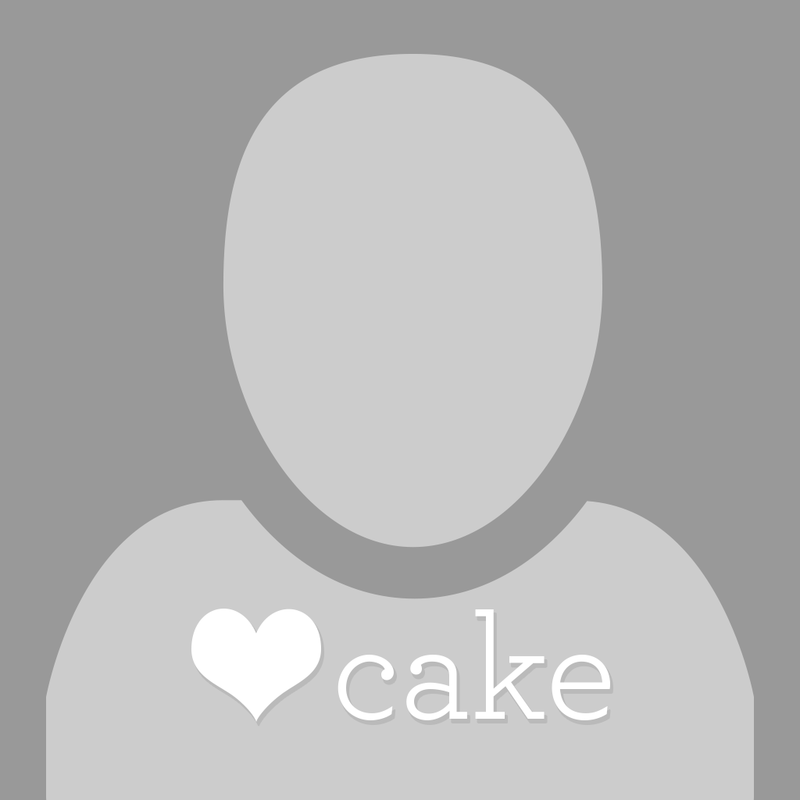 Try to get the cupcakes as close as possible to minimize gaps. When you get near the top, you may want to “dry fit” the cupcakes to make sure you don’t leave a huge blank spot on top. 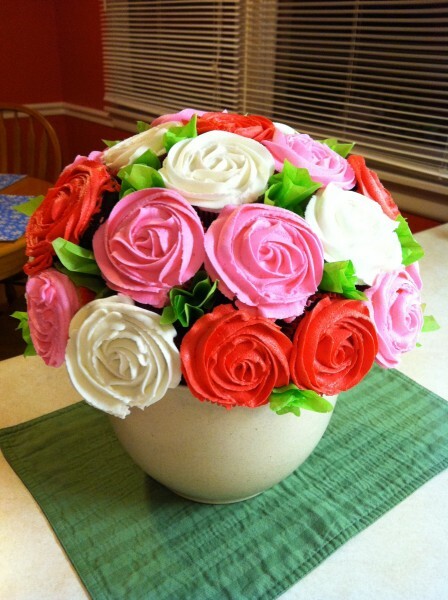 I was able to fit 29 cupcakes on this bouquet. I decided to put 3 different colored roses on my bouquet. Since I used 3 different flavors of cupcakes, and had randomly stuck them to the ball, I started by making the red velvet cupcakes white. I used a 1M tip and did a simple rose swirl on each one. I used indydebi’s buttercream recipe found on this site … it crusts nicely and does not slide off. Next I tinted the white buttercream pink and put a pink rose swirl on each of the vanilla cupcakes. 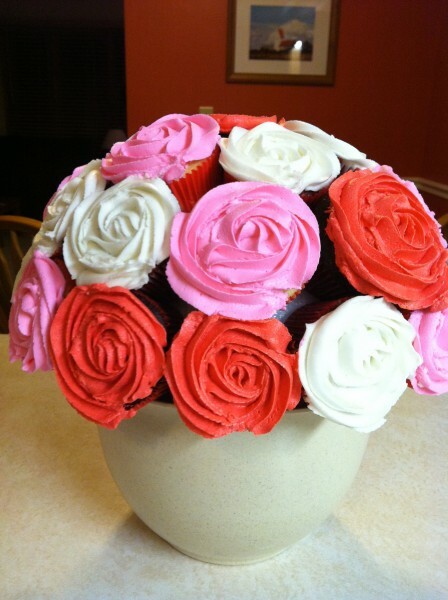 I then added red coloring to the pink icing so that I could put a red rose swirl on each of the chocolate cupcakes. Finally, to fill in the gaps, I cut green tissue paper into small squares, gathered them (one at a time) around the end of a pen, and poked them into the gaps between flowers to look like leaves. Does this work with smbc? Great tutorial! I love the way you varied the colors of the frosted roses. Gorgeous! Will have to try this! Love your bouquet, very classy looking! I'm wondering if you or anyone else knows the best/cheapest place to buy styrofoam balls? I know they have them at hobby lobby and acmoore etc but they are $4/5 per ball which will add up if I do this regularly... Any tips appreciated! Thanks! sign up for Joannes fabric store mailing list .Use the discount coupons for sytrofoam balls.They have become so pricey since they use petroluem to make them. Creativecakesbyrachael.......sometmes the dollar store has the styrofoam balls, etc. Thanks for sharing, can't wait to try this. I like the toothpick idea. THankyou such a good idea and very pretty too! What size are the pot and the ball? This is very lovely and seems simple and quick too! Great Job! Thanks everyone! I don't remember what size pot and ball that is. I just went in to Joanne's and picked out a pot I liked and then found a ball to fit in it. help, I tried this technique but some of the cupcakes keep falling off and sometimes the buttercream slides off the top of the cupcakes. do you have any advice/tips for me? Lovely! Thanks for sharing. I'll give it a try and let you know how I get on. OMGoodness!!! I love this! I am new to this web site, I can see I will LOVE coming here! this is real good, grate idea, i will definately try this pls can u help me with the indydebi's buttercream recipe.this is my second month in this site. 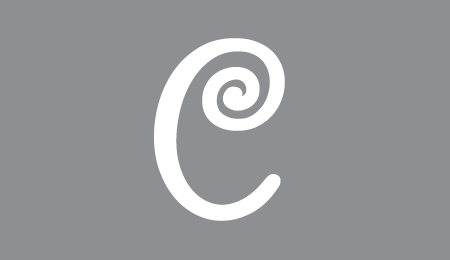 i will be grateful if u reply me, on the other hand can i have your personal site. I saw a similar idea in Cupcake Doctor but this one makes more since financially. I'm curious what your cost was for this. I can't wait to try it! TeriAlece ... I bought a $5 pot and just used extra cupcakes that I had. The biggest expense was the styrofoam ball; I think it was about $16 for the size I bought. I'm looking for a cheaper alternative, but so far haven't found one. Just finished making this, turned out great! I made mine with mini cupcakes in a large teacup. Easy to make. Thanks again! lyndim ... I love the teacup idea! I know what I giving my mother for Mother's Day now. How do these do when you need to transport them? 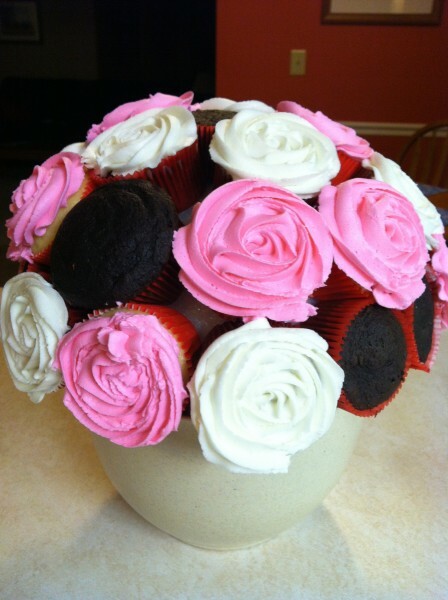 I have a shower coming up and I want to bring a cupcake bouquet, but I'm concerned about driving with it. This is really great. Thanks for sharing your knowledge with us! To help make this a little cheaper you can cut the styrofoam ball IN HALF and secure it to the bowl or pot with double sided tape. Sometimes you can even find a 1/2 circle or dome styrofoam in craft stores. You might as well utilize that 1/2 that hides inside the pot. 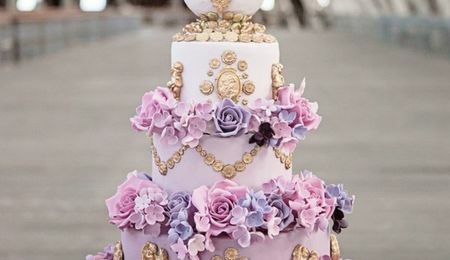 Lovely idea, I am just beginning to make cakes for friends since being made redundant and this looks like something I may be able to make - thank you so much for sharing! 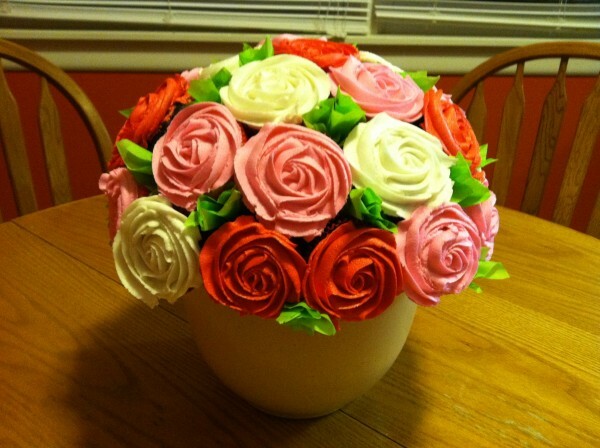 I was curious how much you'd charge for a cupcake bouquet like this? Feel free to PM me or leave your comment here. I have used scrap Styrofoam and glued it together. My husband has a small saw that he saws it into a round ball. You can then cover this with foil. No one sees it and it doesn't matter if it isn't exactly round. Sometimes I glue scrap pieces of Styrofoam together and use a small saw to shape it. You can cover this with foil. No one see it and it doesn't matter if it isn't exactly round. You can use the 2oz plastic cups, like the ones you get at a restaurant with butter or dressing in it. Staple them all together, 1 in the middle and then staple them in a circle around that and they staple another circle around the first circle. Glue it on the pot you have and then put regular size cupcakes in that. Easy Peasy and cheap. I get the cups at walmart. To transport, just get an old box and cut a circle out of it to place the cupcake pot in it. That will hold it in place. I made this last year and it was a big hit. However, transportation was a problem. I had to tell my customers to make sure they had someone with them to hold the bouquet because it would tilt over. I thought about the box idea, but that's a lot of work when you have numerous customers. Hi, maybe try using a head of cabbage, insted of the styrofoam. Its cheaper and edible. Would it work to make a half ball out of rice krispies?? Maybe use chocolate to secure the toothpicks?? Just a thought..
Thanx for the tutorial, really helpful. Love this project, though. I'm going to make one for my Mom. Could you make the directions into a PDF so I could print it out?